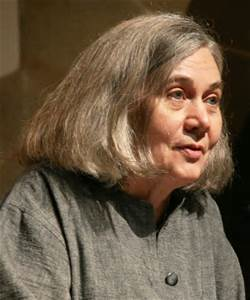 When I first read Marilynne Robinson’s novel Gilead shortly after it came out in 2004, I remember being deeply moved. I read it once and then I turned right around and read it again, something I rarely do. So touched was I at the exquisite portrayal of the aging father writing to his young son, not to mention how the narrator talks about his relationship with his own father and grandfather, that I bought a copy of the novel for each of my sons for Christmas and included in the gift a letter trying to express my hopes, dreams, and love for them. Good literature and good writers do that for us. They are not just stories that we live into for a short time, but they touch us in the places we live, how we relate to the people around us, how we face the complexities, the joys, and the struggles of our own lives. Over the past few months, I’ve reread Gilead (for the fourth time, I think) and then went on to read her next two novels, Home, and Lila. They’re not sequels exactly, but the same characters populate all three stories in roughly the same time in the same place. Robinson’s creates characters of such depth and nuance that we can identify with them as if they were real, regardless of the fact that the reader has almost nothing in common with the characters’ context. For instance, in Lila, the title character is a woman whose grew up in the most difficult of circumstances; her life was bare existence. Yet in the midst of the abuse and violence and scarcity, she knew the deep love of the woman who cared for her. At the depth of her humanness, we relate; we know her loneliness; we know her drive for acceptance; we know her doubts about easy answers. With what seems like perfect timing, the author gradually reveals the characters as the story progresses; the more we read, the more we learn about them and the more we want to care about them. Robinson has such command of the language, masterfully putting words together to form descriptive and evocative sentences. Her writing is beautiful and elegant, yet with a simple economy of language. For instance here’s a passage where the narrator of Gilead reflects on an afternoon when his wife and son brought him a bouquet of honeysuckles. I was struck by the way the light felt that afternoon. I have paid a good deal of attention to light, but no one could begin to do it justice. There was the feeling of a weight of light — pressing the damp out of the grass and pressing the smell of sour old sap out of the boards on the porch floor and burdening even the trees a little as a late snow would do. In her stories, Robinson deals with the bones of life, the things that lie deeply embedded, what makes life the wonderful and sometimes terrible thing that it is: judgment and grace and forgiveness or the struggle to forgive; the constant recognition of the shortness of life, the passing of the generations and the complications of progeny. Neither does she shy away from the harshness and meanness with which the human sometimes treat the other. I recently learned that as an adult Robinson has passionately pursued a study of theology. No surprise to me. While it’s clear from her popular success that one doesn’t have to be a person of faith to appreciate her writing and her stories, I consistently find that her writing informs, deepens, and challenges my own life of faith. She puts the flesh of character and story on some of the most gnarly theological problems. Lila, who by virtue of her marriage to John Ames has become connected to the church — “saved” in the language of the church members — struggles to understand the eternal destiny of the woman who brought her up, cared for her, and loved her deeply. Theological questions are always human questions. Come back on Thursday to read my review of Gilead, and next week, reviews of Home and Lila. I look forward to hearing what you think and joining the conversation. This entry was posted in book reviews and tagged Gilead, Home, Lila, Marilynne Robinson on January 12, 2015 by Jim Honig.